It’s a sad fact that schools in rural, regional and remote Australia struggle to maintain equivalent education standards in science and maths, compared to those in metropolitan areas. And I can’t blame the quality of the teaching staff. The simple fact is that these areas lack infrastructure and support for teachers, have a high staff turnover, and have difficulty filling vacancies with specialist staff. It’s for these reasons, CQUniversity has committed to working with state high schools in Bundaberg and Mackay areas as part of a Regional Universities Network (RUN) pilot project to overcome barriers hampering maths and science education. RUN has been awarded a federal grant of $898,880 for the one-year pilot project: RUN Maths and Science Digital Classroom: A Connected Model for all of Australia. As part of this project, RUN will be developing a virtual centre for school support in mathematics and science that will deliver innovative modes of engagement, support and expertise to students and their teachers in schools in regional and rural Australia. The connectivity of the virtual centre will also form the basis for professional development of teachers. I believe this project will foster a keen interest in science and maths amongst regional students and their teachers, and allow students to apply knowledge to real world tasks and challenges. 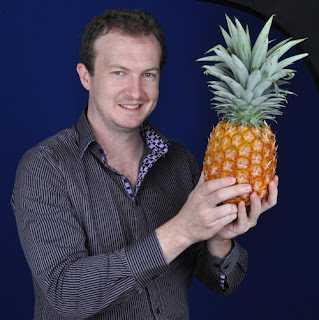 Meanwhile, CQUni’s project management specialist Richard Egelstaff has already been working with high school maths teachers in Gladstone, providing real world examples of maths at work on the job. This is particularly useful in a city such as Gladstone where industry continues to grow and the call for project managers is no doubt increasing. I am so pleased we’re a part of two fabulous initiatives that will inspire our young people to work with maths and science in the future. 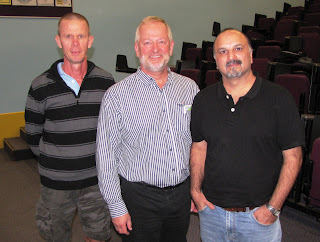 Richard Egelstaff with Gregory Hage from Toolooa State High School and Farshid Paymon from Tannum State High School.